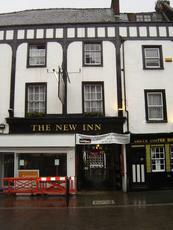 The New Inn is not exactly very new. It is one of the oldest pubs in the country with a fair amount of history. It's a fantastic coaching inn situated in a secluded, but photogenic courtyard. It's not immediately obvious which door is the bar. But just look out for other customers. The interior felt a bit basic. But it still holds a bit of character with its beamed ceilings and uneven floors. The ale range is disappointing - Doom Bar, Atlantic, Bombardier & Hobgoblin. But they did also have Old Rosie cider. Don't come for the beer. But come to see a fabulous building and setting. 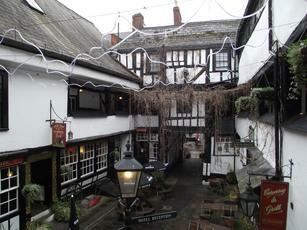 A historic galleried inn which is a "must" visit in Gloucester - hell yeah, even if you don’t like beer. I had 3 cask ales there, all of them served too warm (have they no cool cellar?). Friendly staff. Did not eat, but they do food. Accommodation also available. Great beer but the worst pub food and service I have come across for years. Took an hour for sandwichs - which were on cheap medium sliced bread with hardly any filling. The soup was out of a tin. We had to chase the food 3 times - wished we hadnt bothered. Shame as it had excellant choice of beer on tap. Would never return. Chelsea on tour has it spot on! depressing that such a nice place is ruined by unfriendly locals, a massive 70s carvery trolley and the smell of nursing home. Excellent Betty Stoggs though, and the food to be fair was both keenly priced and tasty. Could do much better though. the cathedral aside, gloucester in general is a complete dump. after a total misjudgement of where to spend an afternoon whilst in the county, we ended up there and just couldnt believe how rubbish the town is and how 'special' the local-yokels are. having quickly realised the re was nothing on offer in the town other than the cathedral, at least we had this historic pub to visit later as some sort of reward. well.... it is an unbelievable shame that such a superb building houses a complete dump of a pub, and a carvery resturant with less charm than a holiay inn. after admiring the stunning galleried courtyard, and getting all excited about the historical aspect of the building i expected something special but found a stagnant and stale pub festooned with gloucester rugby flags and the smell of brasso. the locals were so 'gloucester' i suspect they had webbed feet. i would say 'avoid' but i dont know if there's even a better option in the area.